As any smart home user can attest, installing a home security camera can reap massive benefits including (but not limited to) specialized alerts during break-ins, the capability to snoop on a shady babysitter, or simply having the opportunity to peek into an empty home while away. For one of the many displaced homeowners evacuating the burning town of Fort McMurray in Alberta, Canada, this past week, a home security camera gave him and his wife front-row seats to the fiery destruction of their home — and, unfortunately, there was nothing they could do about it. While high-tailing it to a safe distance away from the Fort McMurray blaze, James O’Reilly booted up a companion smart home smartphone application that provided a live feed of his home’s security camera. Over the course of five heartbreaking minutes, O’Reilly and his wife, Candace, agonizingly watched as the growing wildfire slowly consumed the house they’d owned for nearly two decades. With an opportunity to grab a mere collection of essentials as they hurried out of town, the O’Reillys had no option but to watch as scores of memories, belongings, and (sadly) a pair of clownfish succumbed to the fire. 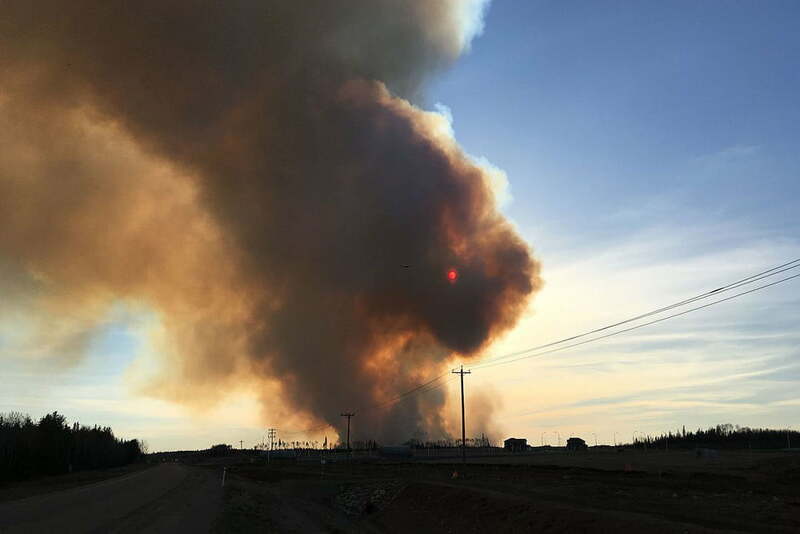 For those unaware, a wildfire of epic proportions has spent the better part of the last two weeks wreaking havoc on a small oil town in northeastern Alberta. Though a cause of the fire has yet to be determined, the blaze has destroyed more than 1,600 homes and buildings and forced local officials to issue mandatory evacuations across all of the area’s neighborhoods. According to one of Alberta’s fire officials, it will likely be months before the burning is extinguished and contained. Though O’Reilly’s glimpse into his home’s demise is an incredibly depressing cherry on top of an already disastrous situation, the video did allow the call for evacuation to quickly spread throughout the area. After O’Reilly shared the video with Metro News, word of the fire’s advancement into his neighborhood — and surrounding areas — made it possible for those nearby to heed the call to evacuate, likely saving lives in the process. As for what lies ahead for the O’Reilly family, the couple did manage to make it out of city limits in a camper, something James says makes them “better (off) than most.” Sadly, a Bank of Montreal analyst says the cost of the fire could reach an astounding $9 billion, likely making the Fort McMurray fire one of the most catastrophic disasters in Canadian history.